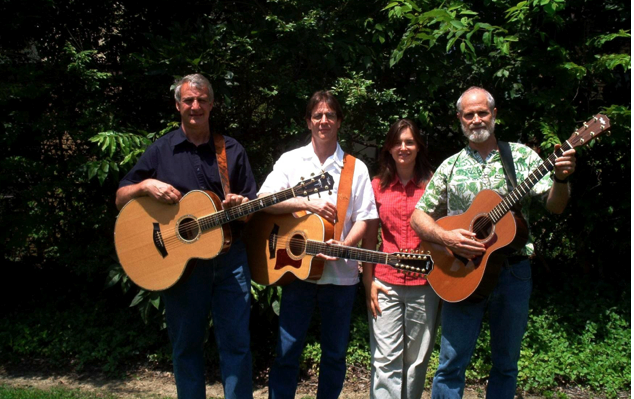 The folk group The Boomers was formed in 1996 by Joe Lombardi, Mike Schaefer and Conrad Shumaker, three college professor/amateur folks enthusiasts who shared a love for acoustic music, especially that stemming from the folk revival of the 1960s. Over years the group added Sara (Groe) Shumaker and J.D. Hatfield . 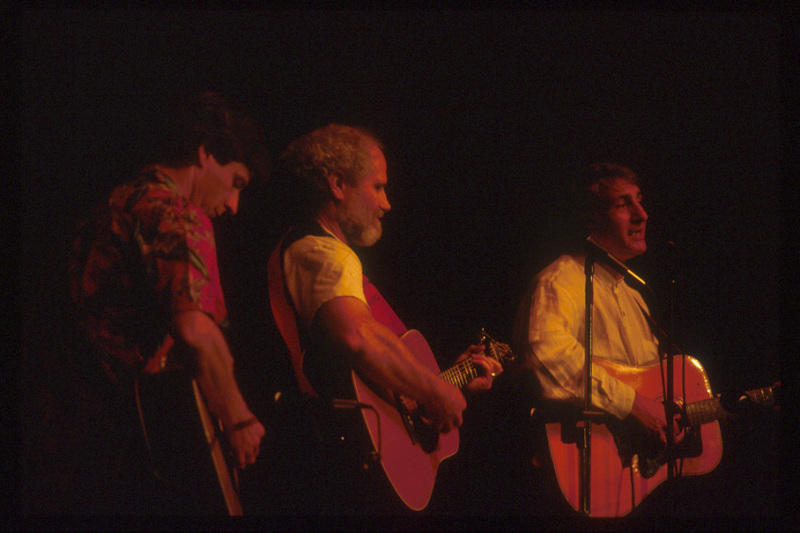 In addition to incorporating numerous songs of singer-songwriters from the 1960s and 70's in their repertoire, both Joe and Conrad have written many songs and today the group now plays a large catalogue of original material as well. 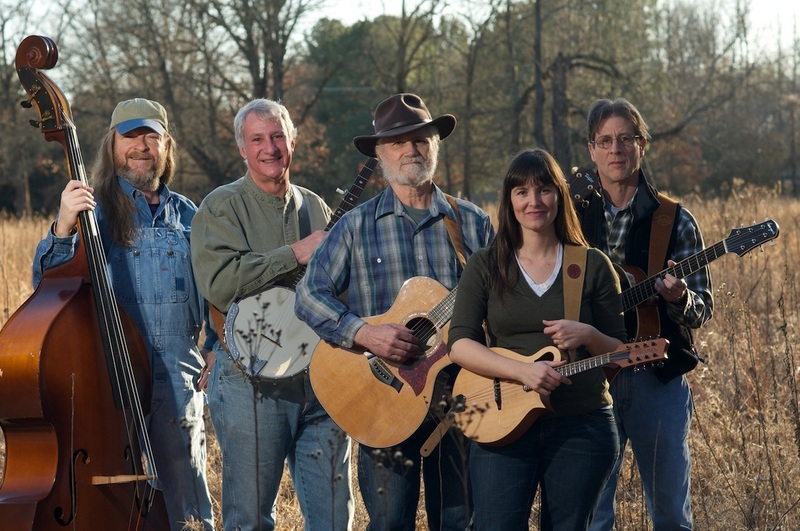 Their instrumental accompaniment consists of six- and twelve-string guitars, banjos, mandolins, upright bass, harmonicas, and pennywhistles. Playing frequently at acoustic venues in the central Arkansas area, they've drawn praise for their "complex and impressive" picking (Arkansas Democrat Gazette) and their "high-energy delivery" (C.A.F.E. [Central Arkansas Folk Entertainment] News). 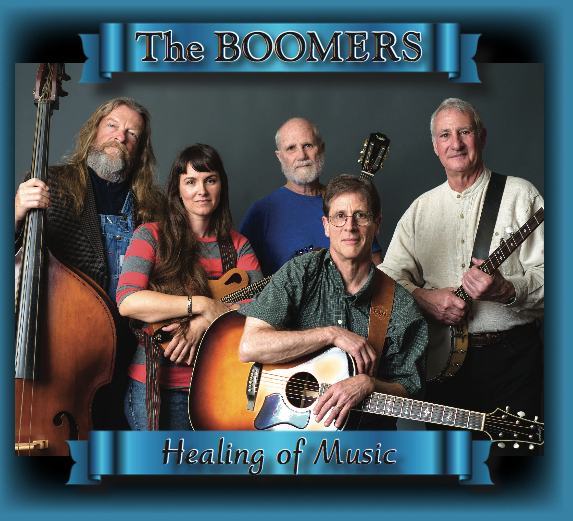 The Boomers have recorded three CD's: Cats in Space (2001 no longer available), Seasons (2007 which may still be purchased from this website) and their most recent Healing of Music (2017) that can be purchased as full CD or individual song downloads, or hard copies through CDBaby [store.cdbaby.com/cd/theboomers1]. Like the two earlier CD's, Healing of music features provocative original songs, driving fiddle tunes, and a few choice compositions by writers from outside the band. See the CD information and some representative songs below. The 'original' Boomers from left: Mike Schaefer, Conrad Shumaker and Joe Lombardi performing at the Arkansas Governor's School, Conway, AR, 1996. 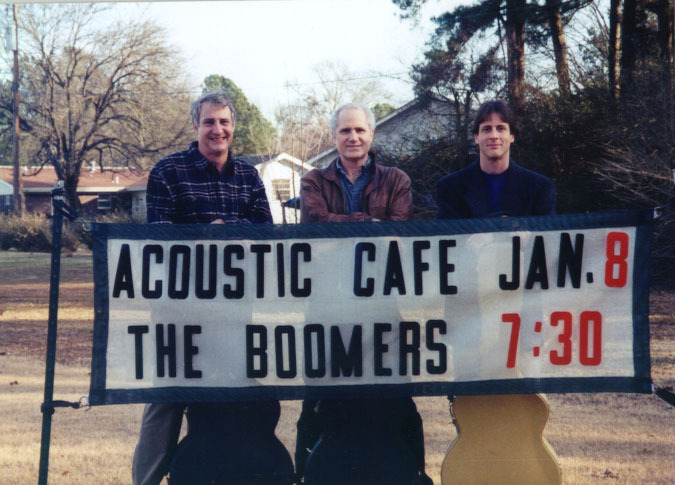 The Boomers from left: Joe Lombardi, Conrad Shumaker and Mike Schaefer before their first performance as "The Boomerrs," at the Advent Acoustic Cafe in Conway, AR, January, 1997. The Boomers in 2007 with the addition of Sara (Groe) Shumaker. From left: Joe Lombardi, Mike Schaefer, Sara Shumaker, Conrad Shumaker. The Boomers performing at the Faulkner County Library in Conway, AR. 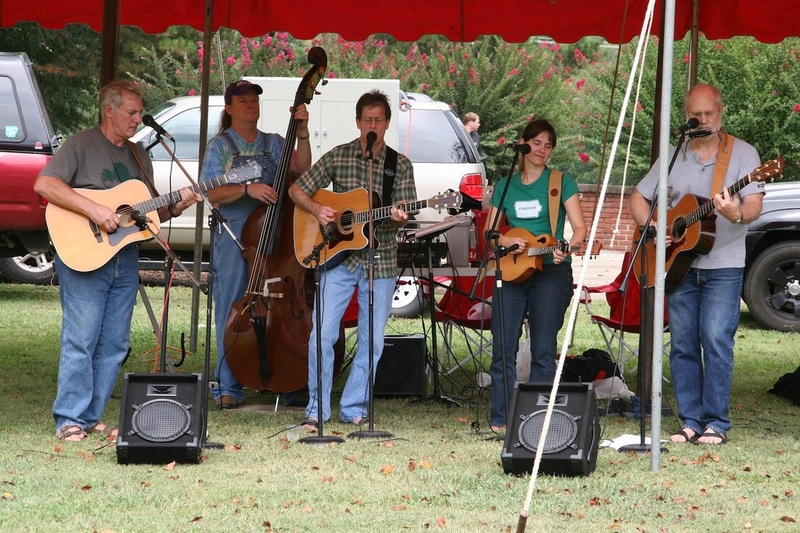 The Boomers performing at "EcoFest" in Conway AR. The following are some songs written by Joe from the Seasons and Cats in Space CDs. "Aaron's Tune" and "Melissa's Melody," from Seasons, are not included on the Portrait CD. "Hurtin' Blues" and "Spring," also not included on the Portrait CD, are from Cats in Space. "A Rocky Mountain Memory," from the Seasons CD, is my tribute to the the late John Denver, a talented singer-songwriter, environmentalist, and humanitarian. 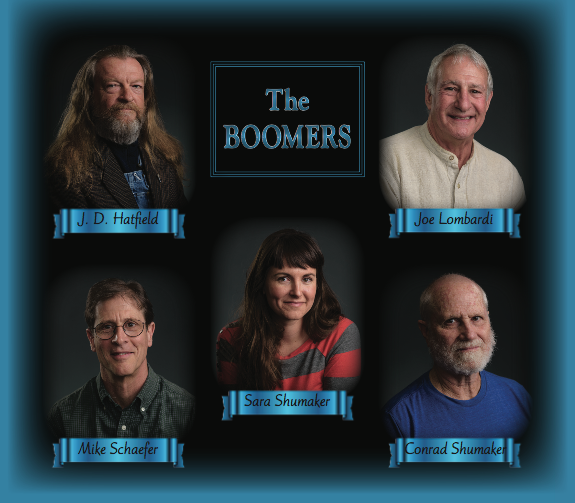 ​"Aaron's Tune" (Joe Lombardi) and"Soldiers Joy" (Traditional) as performed on the Boomers Seasons CD: Joe Lombardi (guitar), Mike Schafer (guitar), Conrad Shumaker (guitar/harmonica), Sara Shumaker (percussion). 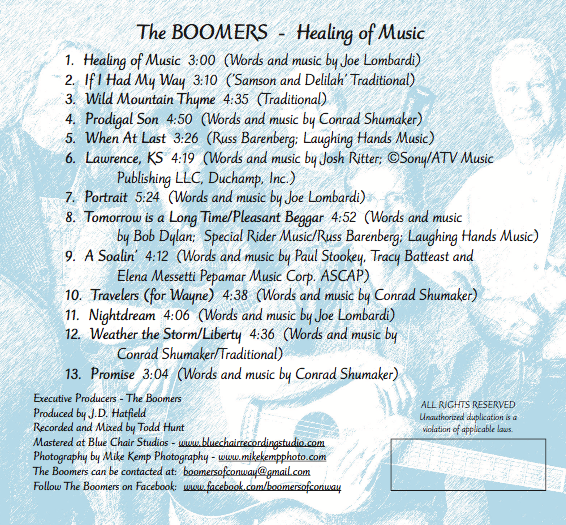 From the Boomers Seasons CD, the title song "Seasons" (written by Joe and also included on the Portrait CD) along with the tune written by Joe titled "Melissa's Melody" as performed by Joe Lombardi and Mike Schaefer on guitars. "Lady of the Mississippi Queen," written by Joe is from the Boomers first CD, Cats in Space. 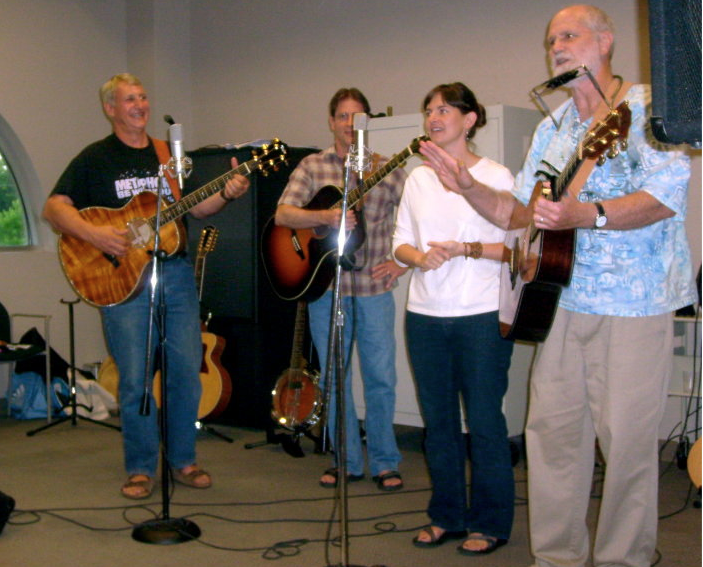 Joe plays the 12-string, Mike plays lead guitar, and Conrad provides harmonica an vocals. We are also aided by Lynn Schaefer on vocals and Jim Harden on mandolin. "Rain," written by Joe is from the first Boomer CD, Cats in Space. The song was written for Joe's three-month old son, Aaron, with Joe on the 12-stirng guitar and Mike on lead guitar. In addition to Conrad on guitar and harmonica, Lynn Schaefer help with the vocals and Jim Herden plays mandolin. 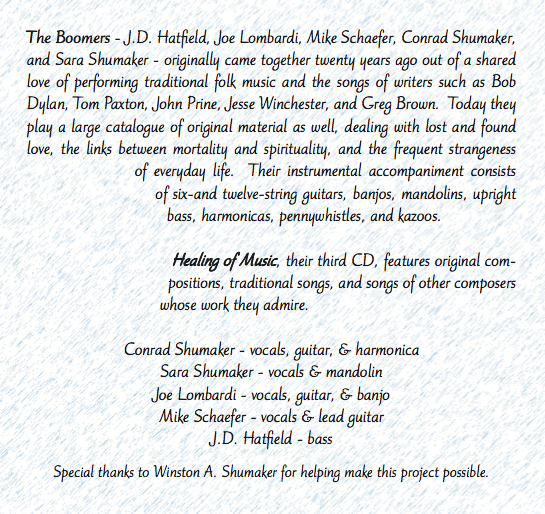 "Hurtin' Blues" (music by Joe Lombardi and lyrics by Mike Schaefer) as recorded on the Boomers CD Cats in Space. Mike Schaefer, guitar and vocal; Joe Lombardi, guitar; Conrad Shumaker, guitar/harmonica. Here are some songs from the Healing of Music CD that were written by Joe. These are 'Boomerized' renditions of the same songs on his Portrait CD.